‘Models’ are qualitative or quantitative descriptions of key components of a system and of relationships between those components. They are powerful tools for addressing complex systems as they can be used to assess and predict the impacts of drivers on biodiversity and ecosystems, and hence their impacts on ecosystem services and human well-being. How these relationships are modelled – i.e. the way in which the link between input and output variables is represented. 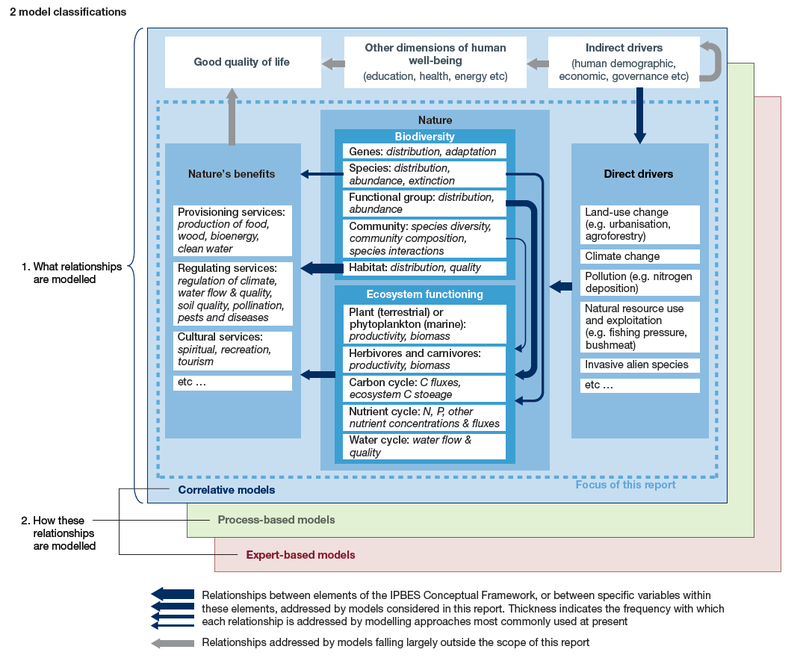 Figure 1.4 Major types of models of relevance to IPBES activities, classified according to ‘what relationships are modelled’ (represented by the arrows linking elements of the IPBES Conceptual Framework, or variables within these elements) and ‘how these relationships are modelled’ (represented by the light-blue, green and pink-shaded panels). All of the relationships depicted on the light-blue-shaded ‘correlative models’ panel can also be modelled using ‘process-based models’ (green-shaded panel) or ‘expert-based models’ (pink-shaded panel). Models addressing the consequences of changes in nature for the benefits that people derive from nature, and that therefore contribute to good quality of life (human well-being) – including, but not limited to, ecosystem goods and services. How these relationships are modelled? Expert-based models, in which the experience of experts and stakeholders, including local and indigenous knowledge holders, is used to describe relationships.